Finely slice the onion, garlic and chilli. Roughly chop the coriander. Cut the salmon into large 1–2cm bite-sized pieces. Mix all the sauce ingredients together in a small bowl. Place your sliced onion at 12 o’clock, then arrange the garlic, chilli, sugar snap peas, salmon, sauce bowl and coriander clockwise around your plate. Heat 1 tablespoon of vegetable oil in a wok over a high heat until smoking-hot. Add the onion, garlic and chilli and stir-fry for 30 seconds until lightly browned, then add the sugar snap peas and stir-fry for a further minute until the peas are slightly coloured. Transfer the ingredients from the wok to a bowl, add a further 1 tablespoon of oil to the wok and return to smoking point. Allow to smoke for 5 seconds to ensure the wok is hot enough for the fish to sear well without sticking, then add the salmon. 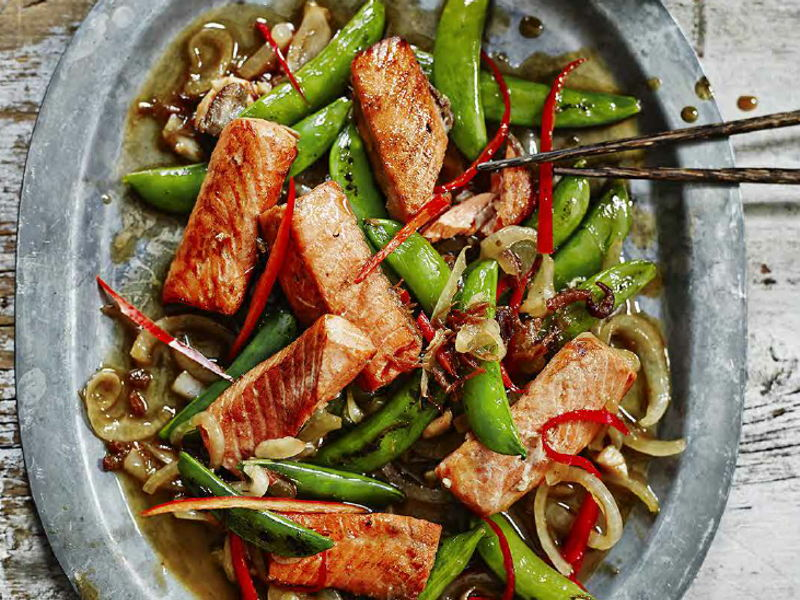 Stir fry for 1–2 minutes until the salmon is browned on all sides.